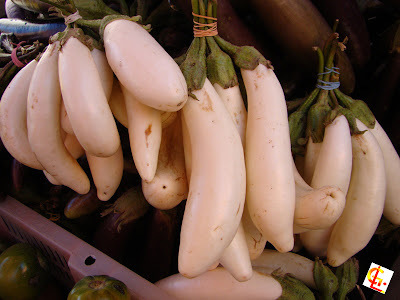 While walking around the busy market day of Sagada, I spotted an albino eggplant. It was so white. This made me curious and inspired to do research regarding all the vegetables found in Sagada. This eggplant has one amazing and revealing story. Eggplants got their name because eggplants used to come in only one color--white. Hanging from the plant, they looked like eggs. The original white eggplant is now very trendy. It is generally smaller than the purple variety, and a lot of people say it's more tender. White eggplants are smaller and more firmly textured than the common purple eggplant. They are denser, creamier and less bitter, even though they can have more seeds. The skin of a white eggplant is tougher than purple eggplant and must be peeled. White eggplants are available seasonally.